This Sunday, Drummers Delight travelled up the M1 to The Goosedale Banqueting Hall in Nottingham. Goosedale is a historic landmark set within over 100 acres of pure countryside. When we parked up we set our eyes on what was some breath-taking views of Nottinghamshire. Music was provided by DJ DIPS (producer of ‘Gera Deh Deh’ featuring Miss Pooja) from Kudos Music. The crowd were definitely not shy to get involved in “Start The Night” performance and they kept the dancefloor packed out all evening: a great party! 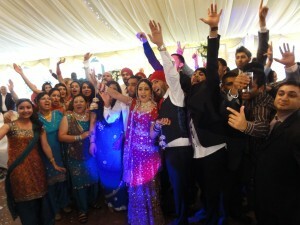 PS: Can you spot Mr Amrit from Karizma Roadshow in the crowd?